Is the honeymoon period between Wall Street and President Trump over? The Dow fell by about 238 points Tuesday, a drop of more than 1%. It was its biggest slide of the year and biggest decline since the election. The broader S&P 500 was also down more than 1%. Neither index had ended the day with a 1% drop since mid-October. This was their worst day since September. The Nasdaq, which includes many hot tech stocks such as Apple (AAPL), Facebook (FB) and Amazon (AMZN), fell nearly 2%. This recent market weakness seems to be a sign that the market tone has shifted to a more negative one, at least temporarily. CNNMoney's Fear & Greed Index, which tracks seven measures of market sentiment, is now showing signs of Fear. The index was in Extreme Greed territory just a month ago. It all just goes to show how quickly emotions on Wall Street can change. In fact, some market watchers noted that when everyone is bullish, that's usually a sign that the market could be due for a drop. Too much of a good thing cannot last. "We are currently experiencing multi-decade high extremes of optimism, and we view this euphoria as a warning sign," said Brad Lamensdorf, founder of research firm LMTR, in a report Tuesday. Other market experts were suggesting that the slump was due to investors growing skeptical about how quickly things can actually get done in Washington. "President Trump's legislative agenda is getting mired in a congressional swamp, as starry-eyed optimism runs headlong into bloodshot realism," wrote BMO chief investment officer Jack Ablin in a note to clients Tuesday. Ablin alluded to concerns that some members of Trump's own party are having with the Republican leadership's plans to repeal and replace Obamacare, lower taxes and spend "bigly" on infrastructure spending. Shares of the Health Care Select Sector SPDR ETF (XLV), which includes drug makers, insurers and other big health care companies, fell about 1%. Caterpillar (CAT), which could be a big beneficiary of any new funding to build roads, bridges and a wall on the Mexican border, was down 3%. "[Trump's] health care proposal appears to be losing momentum faster than most NCAA brackets," Ablin quipped, adding that some Republicans in Congress are "loath to racking up more debt" to pay for stimulus. Some traders also cited a Reuters story that quoted Sen. Sherrod Brown of Ohio saying that Democrats would not support "a wholesale rollback" of the Dodd-Frank financial regulation rules put into place during the Obama administration. Brown is the top Democrat on the Senate Banking Committee. Reuters reported that he made the remarks at an American Bankers Association conference. Bank stocks, which had rallied sharply since November on the hopes Trump would undo Dodd-Frank, were among the biggest losers Tuesday. Bank of America (BAC) plunged nearly 6% while JPMorgan Chase (JPM) and Wells Fargo (WFC) were down about 3%. One market expert said that the recent slump in stocks shows that investors are now coming to the realization that Trump won't be able to get everything he wants done as fast as he'd like. "Trump is trying to be the CEO president. That doesn't work in politics," said KC Mathews, chief investment officer with UMB Bank. "Right now, it's all about hope." But the selloff was broader than banks and health care stocks. Detroit's Big 3 auto stocks GM (GM), Ford (F) and Fiat Chrysler (FCAU) all fell about 3% even though oil prices were sliding. Auto sales tend to go up when gas is cheaper. But there are growing concerns that the best days for the car companies could be behind them. Tech stocks fell too, even as the Nasdaq hit record highs earlier Tuesday. This could be just a healthy pullback after a strong run for the market. Stocks are all still up for the year after all. And White House press secretary Sean Spicer said Tuesday that the administration has "always cautioned" against looking at "one day" and noted that the market "still continues to be up tremendously." Few experts are predicting a correction -- which is a 10% pullback from a market high. Even fewer see a bear market, a 20% drop or more, on the horizon. Mathews said that if Trump doesn't make any significant headway with Congress on some of his key initiatives by late summer, then that could spark a correction. 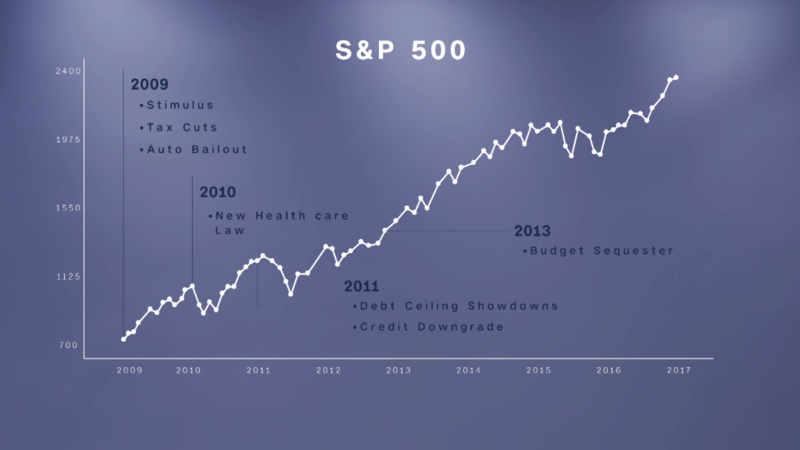 Bruce Bittles, chief investment strategist with Baird, agreed that it will be key for Trump and Congress to actually get something done in order for the market rally to keep going. The bull market celebrated its 8th birthday earlier this month. Can it survive to hit a 9th next year? "It's usually buy the rumor and sell the news. But there is no news yet. There is optimism, but still a lot of caution," he said. "If Washington gets gridlocked, then we run into headwinds."